If you love photography and motorcycles, you already love BikeExif, today they’ve posted an interview with Miguel Galluzzi, designer of the Ducati Monster and head of Piaggio’s new Advanced Design Center in Pasadena, CA. 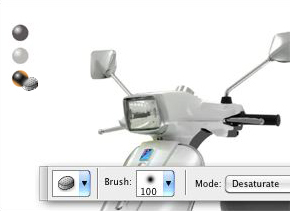 Perhaps we’ll find insight into the future of the Vespa? MP3s Lost In Translation: An Efficient Italian Assembly? SIP Scooter Shop shared a video on their Facebook page today. It is a National Geographic program clip about the Piaggio factory in Pontedera. The video has a few shots of vintage machines in their museum. But one of the views that appealed to me was the factory building tucked in the Tuscan hills shown in the background of the test ride shots. I don’t know if the buildings are the same, but it was reminiscent of those old aerial photos of the factory from the 1950s. Other parts show the processes involved in the building of their larger engines (What are they doing tossing crankshaft halves into big vats of rocks?!) and the assembly of the MP3 hybrid scooter. Not a 2-stroke in sight. I wonder where they build those? I focus on the visual aspects of the video because it’s all in Italian, a language I do not understand. If anyone wants to translate any remarkable points of what looks to be a standard factory tour for the kind of shows that used to make the Discovery Channel great before they jumped the shark, feel free to post below. The New York Times Wheels Blog offers a report on the man behind the original design of the Vespa. The most interesting note for those immersed in all things Piaggio, is that he was left to design trade show displays instead of the helicopters that he really wanted to work on. He was a great designer because he started with the user and moved out from there. Today most things start with an industrial designers screen and are forced around a user, with poor results. Step away from the CAD software and Illustrator, dudes. Just because it makes a pretty picture does mean that it will make a useful object. D’Ascanio knew this. Lets be thankful that he didn’t have the tools that modern designers have. Thanks to Scooterville in Minneapolis for sharing the post on facebook. The owner, Bob, once designed sets and trade show displays and now sells Vespas. Full circle. Two Italians are participating in the Pharaons International Cross Country Rally taking place across Egypt on two specially prepared P200’s. Check out their bikes and short video here and lets hope not everyday is like this. Did anyone notice the Piaggio Typhoon was gone? Was anyone clamoring for it to come back? 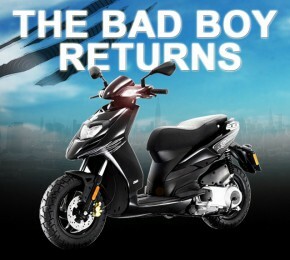 Again, nothing wrong with the bike, but Piaggio USA’s “Bad Boy” marketing is just weird.Perhaps they’re trying to position it as a Zuma 125 alternative: the 80s ‘clawmark’ stickers and yellow paint are definitely from the Yamaha playbook. (You never thought you’d long for spirals, didya?) The Typhoon isn’t quite so, um, “distinctive” as the Zuma (which may be a good thing) and it is $500 cheaper, so maybe there’s hope. Piaggio’s selling 2008 model year MP3s at discounts exceeding $2000. While its pretty discouraging that 2008 MP3s are still on dealers’ floors in 2011 (wasn’t 2008 the year dealers couldn’t stock scooters fast enough? ), if you’ve ever dreamed of riding on three wheels, now is the time, it is a quite great scooter after all. Unspecified discounts are available on more recent models as well. Larry Crowne opens today nationwide. Read our review here and enter our Larry Crowne t-shirt, $25 gas card, and notebook giveaway, which ends tomorrow (Saturday). If those stakes aren’t high enough for you, Fandango’s Larry Crowne Sweepstakes offers a 150cc Genuine Buddy St. Tropez as the grand prize. Genuine Scooter Co. has a marketing relationship with the studio, but PiaggioUSA’s marketing department couldn’t resist getting in on the action. Piaggio’s marketing department emailed a letter to dealers bragging about the appearance of Piaggio and Vespa scooters in the film, and praising Vespa Dallas’s group ride to a screening, with a link to a local news video. Piaggio built their 100,000th MP3 on June 17, 2011 That’s 100 units of each different MP3 model! But seriously, the MP3 has been a big success for Piaggio (though not so much here in the U.S.A.), that’s an average of 20,000 a year since its introduction in 2006. Impressive, but not a transportation revolution, sales of the Vespa from its introduction in 1946 to the millionth unit in 1956 averaged 100,000 units a year! Former Piaggio Americas CEO Paolo Timoni has written an editorial speculating on the future for Dealernews. If we ever seemed less-than-confident in Timoni’s guidance, this editorial piece should make our case nicely. Timoni’s hopes for the future in many ways are parallel those of 2strokebuzz, but we’d never in a million years imply that our dreams are realistic. Granted, he admits it’s all a bit of a fantasy, but one can’t help wondering if Piaggio’s U.S. growth plan was hitched on the same fantasy. I visited Paris in 2006, and wrote about my experiences and shared some photos. I was lucky enough to go back last month (April, 2011) and it seemed that things have changed enough to make a new story and photo gallery worthwhile. With Mini, Smart, and now Volkswagen all (tentatively) targeting the scooter market, isn’t it time for Piaggio to build a car? Indeed it is. Piaggio’s Indian-market NT3 is based on the Ape platform and Piaggio expects it to be available in India in late 2012, and eventually in Europe and Asia. Props to Piaggio for not calling it “Il Nuovo Vespa 400” even though pretty much everyone else is. Thanks for the link, Scooterism! You all follow Eric on Twitter, right? Sources (SDG at Modern Buddy,, Hell For Leather, Scooterism, etc…) report that Paolo Timoni, CEO/President of Piaggio Group Americas since 2005, has left the company. Piaggio has yet to confirm or deny the rumors. PGA imports and markets the Piaggio, Vespa, Aprilia, and Moto Guzzi brands in the U.S.
Update, new prez/CEO is Manuel Martinez, formerly manager of Piaggio Spain. We’ve always loved WebBikeWorld’s great reviews, Larry Gebraski points out they have a good writeup on the Piaggio Museum with some solid advice for travelers.